Last week I attended the 4th Microbubble Symposium hosted by the Leeds Microbubble Consortium at University of Leeds in the UK. The meeting focused on the Fabrication, Characterization and Translational Applications of Microbubbles. I went along to hear about the latest developments in this fascinating area of research and to share my ideas on how our Nanosight & Archimedes instruments could help. Much of the UK work on Microbubbles was shown to be coming from The University of Leeds where they are developing (amongst other things) “theranostic” Microbubbles that double as agents for contrast-enhanced ultrasound imaging and also drug-delivery vehicles that are targeted to specific cancer cell receptors. A large amplitude sound wave is then used to destroy the bubbles and trigger release of the drug at the targeted tumor. These Microbubbles offer a simple and versatile drug-delivery technique that could potentially improve cancer treatment, both in terms of patient experience and overall drug efficiency. Importantly, these bubbles also offer new ways of delivering hydrophobic drugs which have traditionally been difficult to deliver efficiently. I personally found many of the presentations very exciting and was amazed and excited that bubbles have the potential to be used to treat cancer. 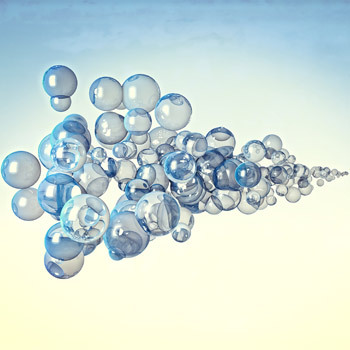 From talking to delegates at the symposium, it’s clear that the field of Microbubbles is changing and there is an increasing demand on the researchers working in this area to come up with more characterized material resulting in mono dispersed bubbles. They are currently relying on microscopy and “slow” means of sizing and counting. Many researchers I spoke with expressed a need to quickly analyse these micron sized bubbles and I assured them that Malvern could definitely help! Whilst Malvern’s Nanosight team has been involved in the field of Nanobubbles for some time, the larger micron particle types are a new area of interest. The unique images of nanobubbles moving under the Brownian motion from the Nanoparticle Tracking Analysis (NTA) system brought researchers over to the Malvern stand during lunch. Following skeptism in the scientific community in the past over the existence of Nanobubbles, this was a very welcome feature of Nanosight, as it of course strengthens the case for those working in the field. Seeing really is believing! Microbubbles also tie in well with the latest in particle sizing, the Archimedes system, which uses the technique of Resonant Mass Measurement (RMM) to size nano and micron sized particles from 50nm to 5 microns.Much of the talk around our stand at the symposium revolved around the unique capabilities of the Archimedes system and its ability to distinguish between positively and negatively buoyant particles. I described how we may be able to use this method to discriminate between loaded and empty bubbles, and also to look at bubbles loaded with liposomes. Ears were pricked and light bulbs above heads were switched on…I think we are all look forward to seeing the results from this! Much to the joy of the delegates, I informed them about the Archimedes Live demonstration “tour” that is due to take place in the UK in the coming months, where they could see this technology in action and analyse their bubbles on site. Needless to say, I will be seeing them all again very soon. If you would like a demonstration of either the Archimedes or Nanosight systems, or want to know more about how we can help you to characterize your microbubbles, please get in touch via our website.